Jam Free Guaranteed when used with recommended Optima™ staples. Durable metal stapling mechanism ensures long-lasting use. Flat-clinch stapling operation forms staples flat on the back of papers for neater stacking. 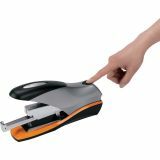 Swingline Optima Desktop Staplers, Half Strip, 70-Sheet Capacity, Silver/Black/Orange - Optima 70 Desk Stapler combines jam-free flat clinch technology and 70-sheet capacity. Offers an ergonomic handheld design that takes less effort to operate. Quietly staple documents from 2 to 70 sheets with high-capacity staples. 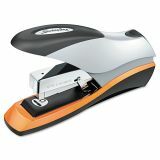 Staple with up to 50 percent less effort than a conventional stapler. Staples lie flat on the back of documents with flat clinch technology. Stapler will not jam when you use Swingline S.F. 4 or Optima Premium Staples. Innovative, Quickload magazine system allows strips of 210 staples to be quickly and easily loaded at the front of the stapler. 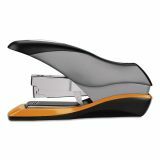 Desk stapler offers durable metal construction, 2-1/2" throat depth and soft grip surfaces. Stand-up design facilitates handheld or desktop stapling. Refill faster with QuickLoad—just press a button and front loading staple magazine ejects.